Focusing on the fastest growing segment of our population, this unique resource addresses the diagnosis and treatment of low vision in older adults. The author, Dr. Rosenbloom, is well known for his expertise in low vision and the care of elderly patients in optometric practice. This practical manual discusses all aspects of the aging eye and offers thorough coverage of both optometric primary care and the management of major ocular disease in the elderly. Other topics include the pathologic, pharmacologic, psychologic, and socioeconomic aspects of aging. 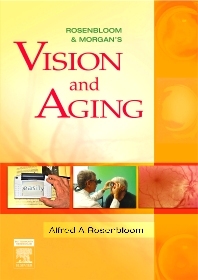 Every chapter reflects the latest advances in treating age-related vision problems. Ten chapters cover hot topics in vision and aging, including age-related systemic diseases, neurological diseases, auditory impairment and cognition, public health aspects of vision and aging, using vision-assistive technology, ethical issues, and vision care for the older driver. Discusses all aspects of the aging eye, offering evidence-based coverage of both optometric primary care and the management of major ocular disease in the elderly. Emphasizes improving the quality of life for older adults, fostering goal-directed activities and an independent life style. Respected contributors provide expert insights into the diagnosis and treatment of low vision in older adults. Covers the pathologic, pharmacologic, psychologic, and socioeconomic aspects of aging.